Daktarin is a cream and powder used to treat fungal skin infections such as ringworm, jock itch and athlete's foot. Click on the option you need below to begin your remote consultation, and take our medical questionnaire. Our doctor and pharmacy service makes it easy to buy Daktarin online. Following approval, your medication will dispensed and shipped by next-day delivery. Daktarin 2% cream is applied directly to infected skin. One gram of cream contains 20mg of the active ingredient miconazole nitrate. Daktarin powder contains 20mg per gram of the active ingredient, miconazole nitrate. Apply as instructed by your prescriber. Daktarin is an antifungal cream and powder, manufactured by Janssen-Cilag. The topical medicines are used in the treatment of fungal skin infections including jock itch, ringworm and athlete’s foot. It contains the active antifungal ingredient miconazole nitrate which works to destroy fungal cells, and clear up the infection. The human skin is home to a variety of fungi that usually inhabit it without causing any problems. However, in certain circumstances these fungi can multiply and cause infection; particularly in dark areas when conditions are warm, moist and lacking air circulation. For this reason, the groin, the feet and between folds of skin provide a thrivable environment for this type of infection to develop. Jock itch and ringworm can usually be identified by a scaly, discoloured patch of skin which is often itchy. In athlete’s foot, these symptoms appear between the toes, and sometimes on the soles of the feet. The condition is not serious and does not usually cause complications, but it is uncomfortable and very contagious; so treatment is normally recommended. The most common forms of treatment include topical gels, creams and powders. They’ll typically be applied twice a day to affected region, for between seven and 10 days. If they are not successful in tackling the infection, oral tablet treatment may be advised. Daktarin 2% cream and Daktarin powder are topical antifungals containing the active ingredient miconazole. The fungi that cause athlete’s foot and ringworm are known as dermatophytes and feed on keratin, a protein found in our skin. Miconazole works by preventing the fungi from being able to produce ergosterol, a substance which they require to maintain cell structure. When ergosterol production is depleted, holes begin to form in the fungal cell membranes, and this eventually kills them. With the fungi dead the infected area can then recover. If you have a fungal infection you should take care not to pass it on to others. The risk of spreading the infection can be lowered by following certain hygiene practices, such as: refraining from scratching the affected area; washing the skin every day and trying to keep it as dry as possible; not sharing hygiene products, in particular towels; and making sure you wash your hands before and after treating the skin. To buy Daktarin online, take our private medical questionnaire, and your answers will be reviewed by one of our prescribing doctors, or our pharmacist. 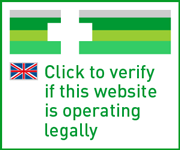 Following approval your order will be dispensed at our UK pharmacy. Your treatment will then be shipped by tracked courier. Follow the directions given by your prescriber when using this treatment. Read the patient information leaflet before use, and if you are not sure of anything, ask your doctor or pharmacist for help. In ringworm, athlete’s foot and jock itch, the typical dose for both the cream and the powder is one application twice daily, for up to 10 days. Wash and dry the area with a towel or flannel. Do not use a shared towel as the condition is highly contagious. If using the cream, apply directly to the affected skin and the immediate surrounding area. If using the powder, it can either be applied directly to the infection site; or dusted inside clothing (such as socks or shoes) which are in contact the affected part of skin. Wash your hands after use. You should also wash any clothes that come into contact with the infection site regularly. If you miss a dose, skip it and apply your next one at the scheduled time. Daktarin powder is not suitable for fungal nail infections. The instructions listed above are intended only as a brief guide. Full details can be found in the enclosed patient information leaflet. Daktarin can cause some users to experience side effects. If you notice any signs of an allergic reaction (hives, swelling of the face or throat, breathing problems or difficulty swallowing), or experience any side effects that become serious, seek medical advice right away. Severe allergic reaction, burning sensation, itching, reddening or rash on the skin. Further details of side effects can be found in the leaflet provided. During your consultation please disclose the details of any medications you are currently using or have recently used. The doctor needs to know if you take any other treatments including anticoagulants (blood thinning drugs) such as warfarin. Please also provide an overview of your current and past medical history. This will help our doctor or pharmacist make an informed decision about your treatment. If you are pregnant or breastfeeding, you may be able to use this treatment, but you should not order it from an online pharmacy. We recommend you speak to your doctor or nurse for further advice. It is unlikely that this treatment will affect your ability to drive or use machines. Daktarin cream and powder are not thought to react with alcohol. Your ability to drive should not be affected by using this product. You should speak to a doctor or nurse in person prior to using this medicine if you are pregnant or breastfeeding. Keep away from children and store below 25ºC. Daktarin 2% cream contains the following ingredients: miconazole nitrate, PEG-6, PEG-32 and glycol stearate, oleoyl macroglycerides, liquid paraffin, benzoic acid (E210), butylated hydroxyanisole (E320), and purified water. Daktarin powder contains miconazole nitrate, talc, zinc oxide and collodial anhydrous silica. Refrain from using this product if you are allergic to any of its constituents. Daktarin cream and powder are pharmacy medicines. This means that a doctor does not necessarily need to issue a prescription for them; a pharmacist can provide them to you after a short consultation. How can I buy Daktarin 2% cream or Daktarin powder online? Click below to begin your order. You’ll be present with a simple questionnaire form, asking you about your symptoms and your overall health. Once submitted, your answers will be reviewed by our doctor or pharmacist, who will issue your medication if suitable. This will then be dispensed at our pharmacy, and shipped to you by secure 24-hour delivery.